After easily losing about 100 lbs on a low-carb diet, and then being stuck at about 50 lbs over my goal weight (which is 40 lbs higher than what my primary care doc says it should be), I suspect that being more than 100 lbs overweight (in my case, either 150 or 190 lbs over, depending on who you ask) permanently damages something in the metabolism. So, while low-carb certainly helps, it is not the answer to life, the universe, and everything. I sure would like to find the missing piece(s). Right now, I'm "tweaking" the low-carb plan, and I've found that eliminating artificial sweeteners seems to help. Maybe if I keep "tweaking" I'll figure out what is missing. As one of the folks whose interest in this isn't purely academic, I certainly hope the damage isn't permanent. Here's one additional clue. Check out Doug McGuff at around 1:15:00 here. He comments that, after looking at thousands of CT scans of obese folk, that they don't have the musculature you would think they would because of the excess weight. Doing a primarily paleo (plus dairy) diet for 6 months got my fasting insulin from 25 to 12. Since my last test, I've added in high intensity strength training to see what kind of a difference that might make. Peter, I'm so glad you posted on this. This question of what drives insulin levels independent of a low carb intake has been making me crazy for the past several years. I am one of those people (a short heavy woman, wouldn't you know) who has been eating a low carb diet for several years without much change in weight. I stick with it because my health is 500% better than it was on a SAD, but like the study participants, I can go a month with no sugar, no grain, no fruit and eat mostly meat and vegetables and at the end of the month, my weight is the same. In response to Beth, I added Doug McGuff's exercise program a year ago with the intention of lowering my fasting insulin, and although I am much stronger, with better muscle tone, my weight has stayed the same. It's extremely frustrating to eat as well as I do, feel so good, but still struggle with my weight. I wish some research scientist would look at this issue as well, and come up some answers. ellen Amgen has in their synthetic leptin trials. The reason is leptin. It never recovers completely. they found several morbidly obese patients who lost amazing amounts of weight need exogenous leptin to lose more weight to get to ideal weight. One of the key things to do in order to lower fasting insulin and leptin, is to check your thyroid and thyroid antibodies. Do you have any other ideas for down regulating insulin? I'm not at the stall/plateau point, but if I were, I'd probably experiment with intermittent fasting, as there are interesting theories about periodic overfeeding, fasting and leptin out and about. I am like Ellen. Short and 30 pounds overweight.I have been eating different versions of 'well' and exercising 'properly' for years and have no change in weight. I have just discovered Gary Taubes and Kurt Harris, which lead me here. I have don't pretend to understand all you are talking about but I have been following a very low carb diet for a few weeks and have seen a 4 pound loss (best results in anything in years, but still seems quite minimal according to all other testimonies) and I decided to get some ketosis sticks to test the ketones. I am very confused. I thought that low carbs would lead to Large ketones, ie. fat loss. An example, yesterday I ate 35 carbs over the whole day, and when I went to bed, the stick read negative. when I woke up I tested again, still negative. How long does it take to go into ketotis? I have randomly checked over the last few weeks and sometimes see large (twice) and sometimes small (twice) but mostly negative. also, I have been taking synthroid for about 15 years. I trusted my doctor on this, now I don't know what to think about that either. I have always struggled with 10-15 pounds but the last 5 years it is struggling with 30 and no results no matter what method I follow. Hi Peter. Thanks for this. So can I take a stab at how this works? Insulin resistant individuals (obese people) are sporting too much insulin in the blood all the time because it doesn't get swept up by insulin receptors. The issue is not that there's a difference in fat creation between lean and obese people after eating. That could be true, but the point is that if insulin's hanging around too long, it will interfere with the fasting periods between meals, so over time you accumulate fat because you don't get enough time to use it between meals. So having less receptors may actually make less fat during eating, as Stephan suggests, but it keeps you from burning the fat you have in the hours afterward. Do I have this right? My assertion above begs another question then: If you're eating VLC long enough, wouldn't insulin receptors decrease their numbers because you simply don't have as much running around your blood anymore? Perhaps this is what's happening when obese people stall due to high fasting insulin. They already have low receptors because of years of overeating on carbs. Then they go VLC and receptors respond by decreasing their numbers even more. Because of where they started (in receptor numbers), they now have a dearth of receptors, causing even small amounts of insulin to hang around much longer than in lean people, whose numerous receptors are mopping up insulin right after the meal. How do we get the pancreas to make the perfect amount of insulin in line with the number of receptors? Why does the pancreas' insulin production respond so much slower than insulin receptors to low carb? But the picture is more complicated. We have an epidemic of metabolic disease, which IMO is probably caused by the increase of dietary carbohydrates - particularly sugars - and particularly fructose containing sugars. While calories in/out really matters - what controls calories in is appetite. I find that carbohydrates (for what ever reason) stimulate my appetite - 4-6 hours after eating the carbs and Proteins and fats do not. I have explained that with insulin, but is it really leptin that is not activated by amylin? How do we explain the change in appetite? Is insulin involved or is leptin sensitivity the key? They used to give anorexics insulin to stimulate appetite, but some studies show it doesn't do that. So what is it about low carb diets that reduces appetite or what is it about high carb diets the incite appetite? Appetite seems to be controlled by leptin, seritonin, dopamine, T3, and cortisol (if not other players). What has the modern diet done to damage the control set-point? Insulin is not degraded by receptors - it is the Insulin-Degrading Enzyme(IDE). What controls the level of IDE? No time for a proper reply but john, does the synthetic leptin normalise appetite, bodyweight and insulin or only appetite and bodyweight? One commenter on the blog is a post-obese person who has used leptin, possibly as part of a study along the lines you mention. "Normal" fasting insulin levels on supplementary leptin? Could the original cause of hyperinsulinemia be a physiological protective response to chronic infection, of which some hints as to possible mechanisms here? The new human microbiome project is set to reveal a great deal more than is currently known about our co-habiting micro-critters and their ecologies. It seems to me not impossible that many of the hormone signals that we think are personal to our individual "selves" may turn out to be part of a wider inter-community (us+our critters) signalling system, and that what can go wrong with such signals could turn out to be a form of inter-community misunderstanding. I'm curious about Gunther's idea.. that insulin levels aren't dropping between meals and at night in obese people. 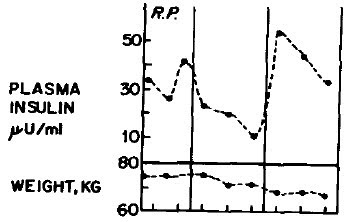 We've all seen the graphs of insulin spikes for 3 meals a day, but has anyone actually graphed 24 hr insulin levels in many obese and hyperinsulinemic people over a period of normal eating? What do those charts look like? Another question I have has to do with the pancreas and insulin secretion. And you become hyperinsulinemic what exactly is going on, and if you do cut carbs out completely, what is that reversal process like if it happens? For instance... suppose someone had a very high sugar diet for years and then went on a low carb diet and lost some weight. If that person then eats a little sugar several months later, do they have an exaggerated response compared to someone who was never hyperinsulinemic? and if so how long does that last? Does it ever correct? What is the mechanism? 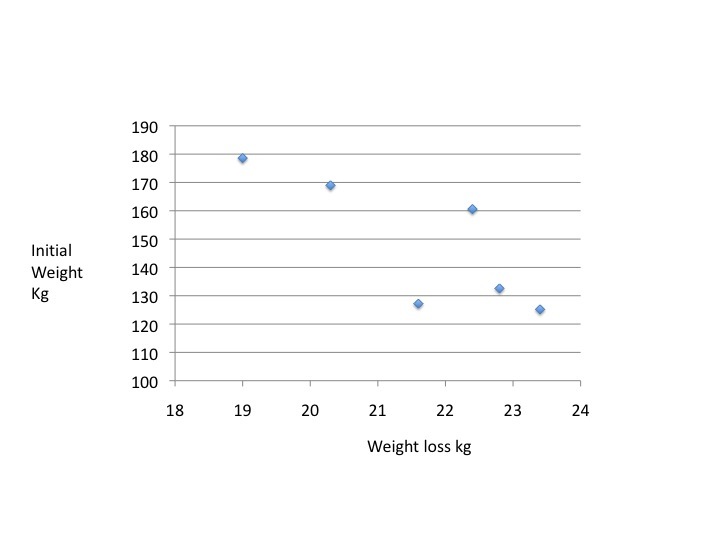 Its done on the 16y boys and girls (obese vs lean) on the 50,35,15 diet (C,F,P). Obese kids have slightly more elevated insulin over night. The effect is more pronounced for girls. Thanks for that study link. That's interesting. And if they are hyper-secreting insulin, maybe it doesn't take a whole lot, snack-wise, to throw that 3 meals a day insulin graph slump out the window. It's a shame because I suspect it's difficult for us to really know what the insulin levels look like. I think someone overweight who is having their insulin levels tested, even if they were allowed to eat whatever they wanted in some clinic setting, would behave a little differently than they would in their day to day life and with their normal diet. don matesz is out in full force again with anti-fat studies. not sure if hes gunning for peter or stephan though. HGs typically only eat once a day during the late afternoon and early evening. Despite what Doug McGuff claims you can't get adequate exercise in a mere eight minutes a week. He also greatly exaggerates the risk of injury involved in exercise. eg most of the injuries suffered by runners or during weight training are simply from bad technique. The American College of Sport Medicine (ACSM) - the world's leading authority on exercise- says an hour of exercise each day (equivalent to walking 6-km) is the absolute minimum. People probably need to spend far more time and ewffort to achive optimum health. I can see two scenarios with Peter's fasting fatties. (1) They have high constitutive insulin secretion and compensatory peripheral insulin resistance. (2) They have permanent or semipermanent high peripheral insulin resistance and must continue to secrete high insulin to overcome it. If they spent years eating lots of carbs fairly often throughout the day, I can see where either situation might arise. I don't know what the molecular explanation would be, however. The more I think about the mechanics of this, the more it seems the problem is not too much insulin, but not enough receptors. I don't know about IDE, but I assume it would be for leftover insulin in the blood after receptors are full, not to mop up insulin before it's done its job. So how do you grow insulin receptors? Like any other health program (like trying to change body composition by working out), it may just take years. We may as well forget the "6 weeks to a better body" stuff we get sold daily. It just doesn't seem to work that way for all. @blogblog I don't think that McGuff has any strong views about what is "enough" exercise. In addition to your ultra-intense weights workout, he's all in favour of having high (non-intense) activity levels the rest of the time; indeed he says that healthy, muscular people will naturally gain an urge to be more active. His claim should be evaluated not by asking "is 8 mins of ultra-intense exercise adequate/optimal (by some unspecified absolute measure)" but whether 8 mins is preferable relative to the standardly prescribed 30 mins jogging three times a week, or even 1 hour walking every day. I'd have thought it was obvious that the weekly weights workout will produce far more benefits than an hour, or even two, walking per day. I'd say that whatever amount of standard 'cardio' exercise is sufficient to beat a weekly weights workout in efficiency is far more than the general population might plausibly undertake. I agree that optimal health would include ultra-intense weight plus as much walking around as you can, but that's not plausible for any-one living a post-industrial life. ganther, u get more insulin receptors with exercise. I think this is well known and that is the exercise is promoted for diabetics. blogblog, I highly doubt you need 1 hour / day minimum exercise. From my experience, and that of people close to me, and my research, I would say that exercising too much could be even more dangerous then not exercising at all. 1 h/d walking made tremendous difference for me. 30 minutes 2 or 3 times a week is all I need to feel good and keep my weight in normal range. Short bursts of effort are IMO very important - running for the buss, dropping down and doing push ups few minutes, especially before eating, avoiding elevators etc. makes big difference and is much more practical then 1h/day scenario that rarely could be followed in real life. I think this shows the degree of metabolic damage an obese person has. Higher insulin correlates well with decreased ketosis after fasting/low carbing in the obese. "In our results, metabolic parameters such as BMI, waist circumference, HDL, glucose, TG, blood pressure, and insulin level were significantly lower in the ketonuria group than in the non-ketonuria group"
"Insulin levels were higher in obese subjects compared to lean subjects in the basal state. In the basal state, there was a significant negative correlation between plasma insulin levels and TKB Ra in obese but not in lean men..."
"Plasma D-3HB and TKB levels as well as TKB Ra were higher in lean subjects compared to obese subjects in the basal state as shown earlier (8,9,10). There are multiple ways to explain this difference. First, the higher insulin levels in our obese subjects can inhibit the activity of the key enzyme in ketogenesis, 3-hydroxy 3-methylglutaryl-CoA synthase(mHS), in the liver. Finally, and more importantly, the lower TKB Ra in obese subjects in the basal state may be explained by lower NEFA levels for these are reported to increase KB production independently of insulin (17). Besides decreasing hepatic ketogenesis, insulin also inhibits lipolysis by inhibiting hormone-sensitive lipase in adipose tissue (4,6). Indeed, we found a convincing correlation of NEFA and TKB Ra in the basal state in lean and obese subjects." The capacity for increased ketosis has been seen as a "metabolic superiority". in obese subjects on ketogenic diets 15 and during starvation.I6 Thus, basal hyperinsulinism may protect the obese diabetic from ketoacidosis, and explain the infrequent occurrence of ketoacidosis in the adult-onset diabetic.The antilipolytic effects of elevated insulin levels also would explain the observation of normal free-fattyacid and glycerol levels after an overnight fast in obese non-diabetic subjects in the face of significantly increased adipose tissue stores.I7"
Blogblog: "HGs typically only eat once a day during the late afternoon and early evening." Even if one agrees with you that all HGs follow one and only one eating pattern, the relevance of modern HG behavior to that of our evolutionary ancestors is questionable. Most (if not all) modern HGs live in arguably marginal environments after being pushed their by more aggressive agricultural neighbors; they've got the land the farmers don't want. WRT to your criticism of McGuff et al vs. the ACSM's recommedations, I think you are at the wrong blog if you think that arguing from authority is going to be perceived as a convincing argument. If you want to speak to the data, have at it. The lower a person's NEAT/SPA*, the fewer kcals/day a person burns, as a lb of fat mass burns far fewer kcals/day than a lb of active muscle mass. See It's all in a day's work (as measured in Joules). Metabolic Rate can increase by a factor of 17 (if you're fit) by increasing activity level. The fewer kcals/day a person burns, the heavier a person gets (for a given kcals/day consumed). Therefore, the heaviest people in the study have the lowest NEAT/SPA. When kcals consumed = 0, caloric deficit is determined by NEAT/SPA. Therefore the heaviest people in the study lose weight at the slowest rate. Q.E.D? For myself anyway, I suspect that delayed and unpredictable stomach emptying is a factor. Marginal land simply means land unsuited to growing crops due to factors such as low rainfall or high latitude. However these places may still provide abundant food for pastoralists or hunters. The Kalahari Desert, Kenyan Highlands and Mongolian Steppes are examples where meat is easy to obtain but agriculture is impractical. In fact semi-arid places like the Kalihari are actually far more pleasant environents for pre-industrial humans than many highly productive agricultural areas such as the US Midwest. There is very good reason to eat once a day. You can't really go on a 10 hour persistence hunt after eating a large meal. Body By Science is superficially appealing to non-experts. In reality it is basically a superficial literature survey written by a non-expert with a few anecdotes and diagrams added. It is riddled with errors, hyperbole and generalisations. McGuff tells people what they want to hear. No good at sport? Blame your genes not your lack of training. Want to spend an extra two hours a day in front of the TV? Don't worry Dr McGuff can magically train you just as well in 15 minutes as anyone else can in 15 hours. I criticise McGuff because he arguably has no real idea what he is talking about. For example on page 44 of Body By Science McGuff has a table describing the various muscle fibre types. He mentions the totally non-existent Type IIAB muscle fibre. Yet every first year exercise physiology student knows that the human muscle fibre types are Type I, Type IIa and Type IIx. No one who genuinely understands exercise science could possibly make such a basic error. Why do those people have lower NEAT/SPA?..." John, I wish I knew. I can happily lie on a sofa surfing the internet for hours on end, whereas my skinny ex-G/F can't keep still, just like the rest of her skinny family. They can eat whatever they like, as much as they like, whenever they like, whereas I have to keep my food intake low (by minimising my intake of refined carbs). I've always been inactive and hated sports. I think it's just the way we are. The way I look at it, if a half-hour BBS workout a week (I yak a lot with my trainer!) gets me to point A on the performance vs health continuum, it will be money *well* spent. re: leptin... Dr. Rosedale suggests in his book to have fasting leptin levels tested as well. The problem for most obese people isn't the lack of leptin but leptin resistance. However, it's certainly possible some people simply are not producing enough leptin. Doug McGuff is a prime example of the "if you can't succeed at something just write a book about it" school. McGuff has never competed in elite level sport, has no formal qualifications in exercise science or sports medicine, has never coached elite athletes. He doesn't even have an impressive physique (175cm, 78kg) for someone who has been weight training for 30 years (he'd probably blame his "inadequate" genes for that rather than his training methods). Dr Robert Atkins, in comparison was an extremely successful (and very fat) Manhattan cardiologist long before he "discovered" his diet and started writing his money making diet books. McGuff in the past has also given some extremely dubious explanations as to why he chose to be an underpaid and overworked small town ER doctor. His strong interest in exercise would suggest a career in orthopaedics, cardiology, sports medicine etc. His excuse is he didn't want to deal in the BS required of these overpaid and "ignorant" specialists. It just comes across as sour grapes. Far from being an expert McGuff's knowledge of exercise science would be considered to be barely adequate for a freshly minted exercise physiology or physiotherapy graduate. Compared with any experienced and PhD qualified exercise science professional it would be trivial. If McGuff gave a presentation at any professional academic exercise science conference he would probably be torn to shreds by the experts during the Q&A session. (I'm fairly sure he has never risked the possible humiliation by actually attending one - he prefers to preach to the ignorant and unquestioning). The fact is that the large scale experimental trials necessary to test particular exercise methods have never been performed. One leading exercise science academic even told me that there is no convincing experimental evidence to support most exercise recommendations. Exercise prescription is, at best, a black art that really requires each subject to be trained individually by a knowledgeable and highly experienced trainer. There is certainly no one size fits all machine-based approach as claimed by McGuff. Body fat levels over about 30% are rare in males and over 40% rare in females. This means that even a grossly obese person often has a far more muscle than an average person. Even sedentary Homer Simpson at 136kg would realistically have around 100kg of lean body mass (40% more than an untrained 75kg man) and up to twice the muscle mass. It is also readily observed that the biggest and strongest athletes are typically naturally fat people who struggle to lose weight rather than naturally thin people who gain weight (bodybuilders, rugby players, shot putters, Olympic weightlifters etc). It is usually fairly easy to (at least temporarily) convert a 130kg man into a muscular 100kg man with calorie restriction and exercise. However it is much harder to build lean muscle on a thin man - five years training to gain 10-20kg is quite normal. "Body fat levels over about 30% are rare in males and over 40% rare in females. " Well Surwit et al., (see Peter's May 29 post further up) managed to find 42 women with mean body fat at 49.16% +/-6.53% for their 1997 study. If they were that rare, I don't see how they could have populated the entire study with them. blogblog, you must realise that everything you've said about Dr McGuff is just empty ad hominem. If it's so easy to tear apart his system, then you ought to be able to simply do that (without making errors yourself) rather than just making a lot of cheap shots. As I recall the years McGuff exercised before he switched to BBS he used traditional training methods (like everybody else who does any weight training). It's ridiculous therefore to blame his not being more muscular on his method. He, like almost every other BBS devotee had long employed traditional methods and found BBS superior for them. From js290's link:- "I began to pay attention to CT scans of patients." and "Even more astounding than the abundance of fat, was the lack of muscle. The atrophy was truly profound." Who to believe? Someone who's examined the CT scans of a lot of patients, or a keyboard warrior? Wow, BlogBlog, it's interesting to contrast your previous comments with later comments. That is a quite hysterical contrast. You quote ACSM as an absolute authority, then later essentially say that there have never been experiments to support particular methods and go on to say that exercise prescription is a black art. And by your standards, how many world class physiques have been created by the ACSM? I'm chuckling as I write that. I can't say I'm a fan of McGuff's. I think he comes across like a bit of a schmo when he talks and a number of the studies he cites in BBS don't quite seem to say what he claims they do. But the obesity/atrophy thing seems plausible if not perfectly accurate. Check out the difference in the spinal erectors (bottom center of each scan) in an obese patient compared to one of normal weight. Not to pile on to @blogblog too much, but like I said, this is a place where people are not going to let ad hominem or ad potentiam arguments just slip by unchallenged. Marginal land simply means land unsuited to growing crops due to factors such as low rainfall or high latitude. However these places may still provide abundant food for pastoralists or hunters. No, that's not all of what "marginal land" means (and btw, most people do not count pastoralists as HGs). That aside, the thing you're not considering, i think, is that HGs who lived in harsh environments were not all or even most of the population of humans in our pasts. There is no reason to think that all those other, lusher environments were not chock-full of HGs, too. The later-to-become-agriculturalists started out as HGs in more abundant environments, and we have no idea how often they ate, or played, or whatever, because there basically aren't any left to observe. The closest you can get is accounts of the Pacific Northwest natives who had access to extremely abundant marine resources (and whose society was strikingly different from other hunter-gatherers, probably as a direct result). I suspect that the lusher environments supported greater population levels, and it could even be possible that as a result most people's genes derive more from the abundant HGs than from the harsh HGs. So to my mind, pointing to modern HGs is not particularly informative, other than to say, Wow, humans sure are good at taking up a variety of ecological niches. Which of course may not be necessary in the more common, more abundant environments in which most HGs probably resided. McGuff tells people what they want to hear. No good at sport? Blame your genes not your lack of training. It is also readily observed that the biggest and strongest athletes are typically naturally fat people who struggle to lose weight rather than naturally thin people who gain weight (bodybuilders, rugby players, shot putters, Olympic weightlifters etc). If that's not a genetic predisposition to success in certain sports, I'm not sure I understand what you're talking about. And I would be very interested if someone pointed out a short world-class basketball player or a tall, leggy Olympic gymnast. How's this for another hypothesis (which doesn't exclude my first one)? The fatter a person is, the higher percentage of weight lost is body-fat. This results in a slower rate of weight loss, as body-fat is much more calorie-dense than muscle. 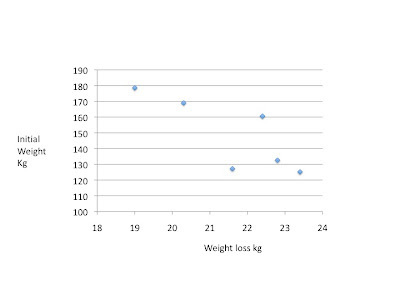 Hi Howard and Nigel, the link from justdoinglife at http://www.ncbi.nlm.nih.gov/pubmed/17848938 has a lot to say about weight loss per calorie cut at various BMIs and has a lot to say about "stalls" and why everyone needs to cut calories as weight loss progresses, including why techniques to minimise muscle loss might increase fat loss without bodyweight or BMI loss. It will need another post I guess. Some is simply complex math on tissue energy density as alluded to by Nigel. Again, this looks at events during enforced correction with hunger, not mechanisms or causes of obesity, but the paper is useful and probably correct in many of its assumptions. Simplistically, if you start with a BMI of 33kg/m2 and only 4% bodyfat you are going to lose nothing but protein during a water fast. You would lose only protein because you don't have anything else to use and probably be very dead quite quickly! Interesting to see who would live longest on a water fast, an obese Jo or a musclebound icon. It doesn't seem to have a great deal to do with the water fast study at very high BMIs, I'll see how it pans out when I get the chance to get back to posting. Ellen, the comment that john makes about leptin never completely recovering may be part of the answer. Adipocytes which have been huge may drop leptin production, allowing hunger (via hyperinsulinaemia/depressed lipolysis??? This will be intersting to see when john gets his blog up and running) to kick in at higher body fat, ie up upregulates your fat "set point". This would be quite independent of how a person got there in the first place. OK, that's abegining to comments, time to go do stuff, back to comments when there is less to do! There is no doubt at all in my mind that certain foods have drug like qualities. It's rare (but not unheard of) for people to "pig-out" on steak. But once people start on carbs or carb-fat combos it becomes quite common. It become quite difficult to then disentangle whether the long term metabolic consequences are a result or a cause. ie, do people who go "face down in the carbs" do so on first exposure, once they are "addicted" or once they have developed the metabolic consequences of chronic consumption? From my own view I would never in the past simply go face down in anything, and never was overweight. When hunger hit it was always 2-3 hours, during either the "withdrawal" period or during the reactive hypoglycaemia period. Metabolic or neurologic? Where is the overlap? Bear in mind that I was anti sugar but pro starch most of my life so may be more a metabolic hungry person rather than working from a food reward basis. Interestingly, for various reasons, I have been utterly anti-Nestle (the food company) since my oldest daughter was born. My view of the food industry in general followed my view of Nestle, so I mostly avoided junk food... But I was always hungry 2-3 hours after most meals. It was getting worse with age and I was staying slim with a little pot belly. So my drive is towards a metabolic view. There will, undoubtedly, be more to it. On the receptor ideas it's hard to say. You would need insulin turnover figures to try and get an idea of what was going on but I would guess that low turnover would give greater scope for a minor mismatch to persist. But whether the mismatch is at secretion or use level would need far more information than I have. There are many questions which follow on about the time scales for glucokinase production, GLUT4, GLUT2 and IDE production. Why does everything happen over a three day time scale? Does the body prefer a glucose spike to having the pancreas permanently primed to produce insulin at the drop of a tuber? All worth thinking about. karl, as above, my appetite responses have a lot in common with yours. We will have to see re leptin. I keep being dragged back to the idea that food choices based on insulin response (with an eye on glucagon) have normalised my own appetite. But appetite can normalise for a while on vegan low fat or all potatoes diet too. These need consideration. Always remembering that health and appetite are not the same thing. This post is now getting sufficiently ancient that it's quite hard to work through all of the deserving comments which need a reply. I might have to call a halt here and if anyone would like to repost off topic queries when I get to some of the string of posts I need to get up, that would be fine. With apologies for the chaos which results from my life as it is at the moment! "Of course addressing what causes elevated fasting insulin and why it doesn't normalise on prolonged fasting is a whole new ball game. People should look in to it. Carbohydrate restriction obviously gets you part way to sorting the problem. It side steps it rather than curing it. I have said this before." This blog post is from 2011, but is the most direct anything I've found on the subject of high fasting insulin in the obese. In my own case my insulin (20 hours fasted at time of blood draw) was 47 on a normal scale of 2-12 after being on a keto diet and doing OMAD intermittent fasting for about two months. I'm thinking prolonged water fasting may be my only remaining option, but it is so difficult. I feel so weak when trying. If you could direct me to any new insights from the last seven years I would very appreciate them. Also interested in how GLP-1 agonists may change what is going on. I weight 470 US pounds, and it is what my doc wants to put me on even though my A1C is 5.5. Endocrinology is fascinating.